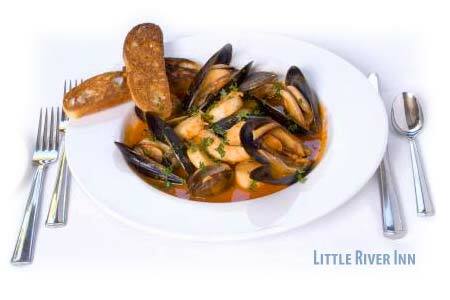 Little River has some of the most popular restaurants on the Mendocino Coast. Enjoyed by visitors and locals alike, there is always something fun happening at the Little River Inn. It is always a good idea to make reservations, some of the smaller restaurants book-up quickly! Enjoy a great meal in their elegant dining room. Executive chef MARC DYM is best known for his seafood, crab cakes, steaks and a fabulous Champagne Brunch, served on both Saturday and Sunday. The Innkeeper's Kevin and Sandy treat Circa '62 as an extension of their home, with a hearty tribute to the Great American Breakfast coupled with an eye for fun and unforgettably warm hospitality. This ocean view restaurant makes every meal a spectacular dining experience, with delectable, fresh dishes, using only the finest organic ingredients from local purveyors. Menu changes daily. Reservations recommended.